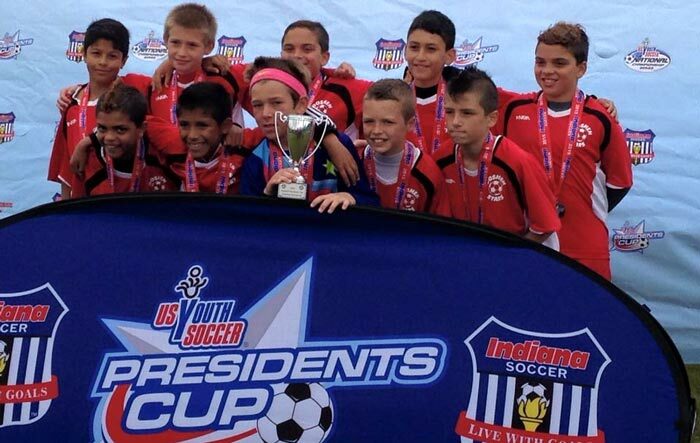 Recently, this small soccer club in Goshen, consisting of about 200 players and making up 18 teams, entered several teams into the Presidents Cup Tournament. This tournament is held for any Indiana Soccer League team. Some of the local preliminary games were held in Elkhart, Ind. in May. The U11 Boys 2nd Division: White team entered into the tournament but were knocked out in the preliminary rounds. The U11 Boys 2nd Division: Black team that won their first semifinal game 4:2. Then lost 2:1 against Indiana Fire Juniors 04B. Well fought Goshen! The U13 Boys 1st Division team and Boys U11 2nd Division: Black team played and qualified as semifinalists to go onto Grand Park Sports Complex in Westfield, Ind. to compete. Goshen U13 boys team won 1:0 against Columbus Express (a current third-place Premier team). Then pushed forward and won 3:1 against Ft. Wayne United FC (a current sixth place Premier team) to win their cup! The U13 Division Presidents Cup was then awarded from this team in gratitude onto Millard Graber (current president) for his outstanding service with Goshen Stars Soccer Club. They are now going onto Regionals in St. Charles, Mo. in the month of June. Best of luck. GO GOSHEN! Goshen’s U14 Boys Red team (Premier division) also entered into the State Cup but came in second place in their bracket. Awesome job, boys! This small club has been producing many quality teams winning the State and Presidents Cup tournaments in the past several years. A few have even won Regionals and have gone on to compete in Nationals as recent as 2013. An example of these types of quality players are the recent Goshen High School Varsity Soccer team that won the State Championship this year! The majority of the team had come through this club. Most of the coaching and managing staff are volunteers from the Goshen community who believe in serving the kids by playing one of the world’s most popular games. As always, we welcome more volunteers who enjoy teaching and playing this sport. 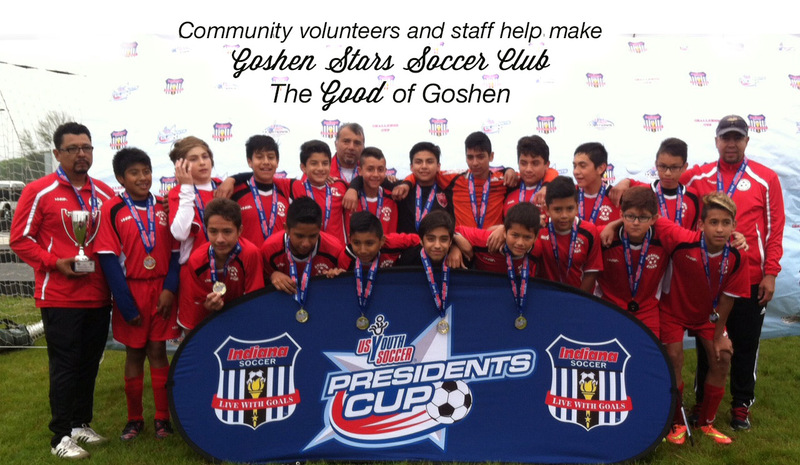 The Goshen Stars Soccer Club exists to grow a healthy community and promote the development of select/travel teams for Goshen’s more highly skilled youth players in order to maximize their soccer potential. We are part of IYSA and compete in ISL (Indiana Soccer League).